Do all your loose pins need a home? If so, don't settle for a boring pincushion. No, no, no. There are way too many cute crochet pincushion patterns available for you to let that happen. This selection of free crochet patterns includes a range of colors, styles, and techniques; there has to be something in here for you to add to your own sewing kit. These are also a great gift idea for anyone you know who sews. The tomato pincushion is one of the most classic designs, something that almost everyone has seen. This crochet variation is unique in that it adds a secondary color (not green) for the leaves. More than that, there's a crochet strawberry hanging off the edge of it. 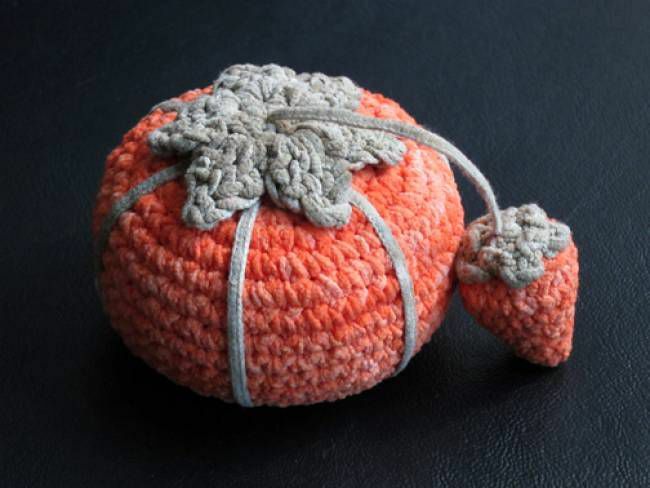 The designer notes that you can fill the crochet with your own stuffing or simply wrap it around an existing tomato pincushion you already own. If fruit is too healthy for your home and you want more of a treat in your sewing kit then try your hand at making this donut crochet pincushion. Make the donut in your favorite "flavor" by changing your color selection for the cake as well as the icing. The "sprinkles" are made by the tops of the pins themselves. Basically, any amigurumi crochet pattern is fair game to convert into a pincushion. Crochet food seems to be a particularly popular choice for both amigurumi and pincushions, so look to those patterns for ideas. A few options in addition to this pineapple pincushion include pincushions inspired by watermelon, fried egg, and sweet potato. Make two matching sizes of any crochet motif, stitch them together with stuffing in the center, and you have yourself a pincushion. This one is made using the African Flower motif. The designer suggests putting it in a small jar and decorating the jar and then giving the whole thing as a gift to someone who loves to sew. This free crochet pattern shows you how to crochet a granny circle (a round version of the popular granny square motif). This circle, used as the top of the pincushion, is combined with a solid crochet circle to create the pincushion. Two crochet motifs sewn back to back make a great pincushion. You can make a bigger pincushion, though, if you crochet several motifs together first and then make a back sized to match. Here there are four daisy-center granny squares stitched together to make a pretty springtime pincushion. The button center is a nice touch. Brighten even the rainiest days with an easy crochet sun. A simple circle with an easy edging makes the sun; filled with stuffing it becomes a happy pincushion. Crochet cacti are a popular pseudo-plant, and you can make them in all different sizes. Any stuffed cactus works as a pincushion. This one is worked in three parts: the body and base of the cactus and the flower on top. It makes a perfect addition to your desktop or mantle when you aren't using it as part of a sewing project. This crochet pattern comes in three parts. First, there is a pattern for a square to make the quarter sunflower that is shown on the front of the pincushion. Instead of a plain backing, there is a second square pattern that has the design of the back of a quarter sunflower. Then there are the instructions for combining these squares into a pillow, which can be used as a pincushion. This is also a good reminder that any small pillow can double as a pincushion crochet pattern. You can even purchase small pillows and then cover them ​in your own crochet designs, including freeform crochet and motif-based crochet, to create one of a kind pincushions. Have you ever wanted to stick pins in a voodoo doll? Well, now you can, with your own crochet voodoo doll pincushion. Even if you don't have any negative feelings to express, this can be a fun addition to your sewing kit or a cute gift for a cheeky friend.